Cork dug deep to deliver their first Liberty Insurance All-Ireland Intermediate Camogie title since 2006, with a 1-13 to 0-9 win over Down at Croke Park this afternoon. Three times level, including early in the second half, Cork pulled away from Down aided by a 40th minute Caitriona Collins goal. Having lost the previous two deciders, including last year to Meath after a replay, Cork were appearing in their ninth decider since last lifting the Cup. 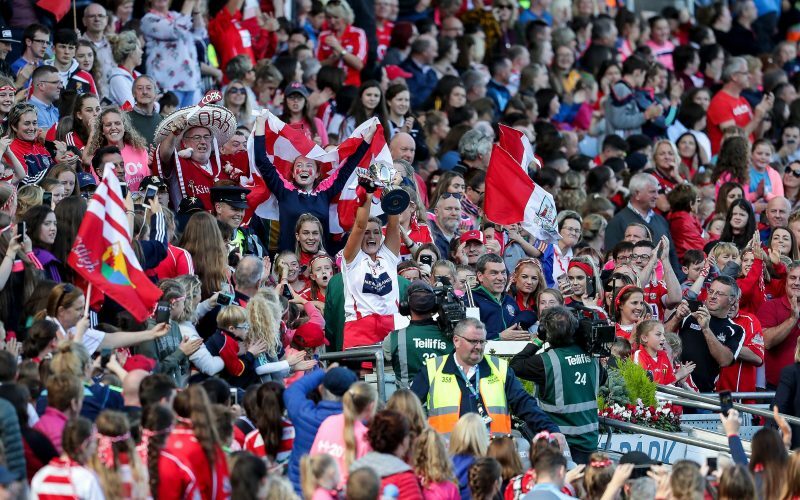 It was the first of two finals for Cork manager Paudie Murray, who also is in charge of the Senior side, and this Rebels side certainly marked their cards for a potential step up in future with some excellent displays, particularly in the second half. Featuring 11 of the side that lost to the Royals last year, Cork came out on top in a battle royale, with a memorable contest served up by both sides. This game began at lightning pace, and although Caroline Sugrue registered a wide after 20 seconds, the games opening score arrived withe less than two minutes on the clock from the stick of Sara-Louise Carr. The Mourne County doublled their lead a minute later through teenager Saoirse Sands, but Cork responded well. The Rebelettes delivered in strong fashion, with Player of the Match Saoirse McCarthy firing the first of three first-half points from play. The Courcey Rovers half-forward was key throughout for Cork and after Caroline Sugrue fired wide, McCarthy levelled with another well-taken score. Down hit a purple patch between the 10th and 16th minutes with Niamh Mallon firing from a free and play, before a Katelyn Hickey score, as Down took a 0-5 to 0-2 lead at the start of the first quarter. Catriona Collins registered Cork’s first score in 11 minutes, before the sides traded points to tie the game on 24 minutes. Cork began to pile on pressure at this stage, but Down marshalled well at the back with goalkeeper Maria McNally marshalling well. Firstly denying a Katelyn Hickey effort, and then clearing a Maeve McCarthy effort. Murray’s charges added two further points before half-time with Sugrue and McCarthy on target to ensure a 0-7 to 0-5 interval advantage. Both sides were eager to add to their tallies on the restart, but registered a wide apiece inside the opening two minutes, before Down equalised thanks to scores from Mallon and Sands. However, Cork took the lead thanks to a third Catriona Collins point – one her side wouldn’t relinquish for the remainder of the hour. This came in a strong Cork patch where they scored 1-3 without replay, including the lone goal of the hour, which Catriona Collins netted after some excellent work in the build-up. Siobhán Hutchinson initally making a great catch, before Fiona Neville laid off the final pass. Down kept the score-board ticking over through Niamh Mallon, but the loss of Sara-Louise Carr on a second yellow card was a tough one for the Mourne County to take, as Down closed out this game, with three of the final four scores to take silverware. After the game Cork captain Sarah Harrington accepted the Cup from Camogie President Kathleen Woods.